Equity interventions are intended to help the poor acquire the goods and services that they currently cannot afford. Although a heartfelt case is easily made for these well-intentioned interventions, Eugen Böhm-Bawerk, F.A. Hayek and other Austrian economists consider them to be an attack on freedom and puts our posterity on the road to serfdom. I demonstrate this using a simple model of demand and supply. In this process, we discover the true source of white privilege. In a free society, the government does not interfere in the voluntary transactions and contracts between consumers and producers, or between workers and employees. In this system of free enterprise, the forces of supply and demand efficiently allocate goods and services. The figure below illustrates how this occurs. In the figure above, the price is determined by market forces, supply and demand. At point A, the blue consumer’s demand curve meets the red firm supply curve. If the product in this market is a laptop and each consumer buys one laptop in a given period of time, 3500 laptops are purchased by 3500 consumers, and each of them pays $350 for a laptop. However, all consumers are not equal in terms of their willingness to pay. Suppose consumers are placed in a queue according to willingness to pay. The highest willingness to pay is at the left endpoint of demand and the lowest willingness pay is at the right endpoint. 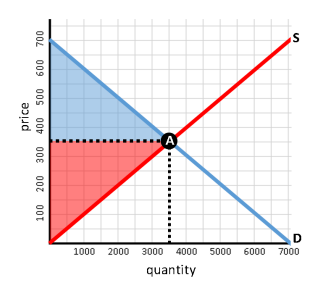 The above demand curve would then imply that the first consumer is willing to pay $700 (the left endpoint of demand) for a laptop, but the last is willing to pay $0 (the right endpoint of demand). Since all consumers pay the market price, $350, a benefit of $350 accrues to the first consumer, the difference in the price that is paid and what he or she is willing to pay. Since demand declines from left to right, the benefits of having to pay just $350 declines from the first consumer ($350) to the 3500th consumer ($0). Summing these benefits across laptop buyers is called consumer surplus. It is modeled by the semitransparent blue triangle in the above diagram. Because a point on the supply curve can be interpreted as the minimum price firms are willing to accept for a given level of output, the difference this price and the market price represents a benefit that accrues to firms. For the first laptop sold, the figure indicates that the minimum price firms are willing to sell it at is about $0. Thus, the benefit that accrues to the firm that sells the first laptop at the market price is $350. Since supply increases from left to right, the benefit of selling each additional laptop declines from $350 for the first laptop to $0 for the last laptop. Summing these benefits across laptop sold is referred to as firm surplus, which is modeled by the semitransparent red triangle in the above diagram. If the above diagram models a labor market, price is the hourly wage rate, the red line is the labor supply of workers, the blue line is the labor demand of firms, worker surplus is the semitransparent red area, and employer surplus is the semitransparent blue area. The sum of consumer and firm surpluses (or worker and employer surpluses) yields the measure of social welfare that economists call total surplus. It is maximized at the competitive equilibrium, point A. Since only the most efficient producers can produce products below market prices, economic efficiency is greatest when markets are competitive and government does not intervene. This means the collective economic well-being of people who participate in free and competitive markets cannot be improved by government interventions. The question that separates economists is whether government should intervene or not. Economists battle each other in this equity-efficiency debate. Those who side with intervention use normative arguments like: Government should intervene in markets to legislate a wage that allows the working poor to deal with the skyrocketing cost of living. Such normative arguments are difficult to oppose politically because they tug on our heartstrings and can be easily made in the few seconds one is granted in a segment on the evening news. The minimum wage rate and rent control laws are great examples of such equity interventions. If the above figure is used to describe Hypothetical City’s rental market and its low-skilled labor market, the market determined monthly apartment rent and the weekly wage rate are both equal to $350. Suppose the majority of Hypothetical City’s aldermen believe rents are too high and wages are too low. As a result, they enact a minimum wage rate of $500 per week and legislated rent of $200 per month. The horizontal black line in the left graph below is the city’s minimum wage while the same in the right graph is the city’s maximum rent. The two polices are intended to boost the standard of living of Hypothetical City’s residents. For the residents who continue to work 40 hours per week, 50 weeks a year, the minimum wage raises their pay by $150 per week, or $7,500 per year. If rent control does not alter their housing status, rents would decline by $150 per month, or $1800 per year. The net annual benefit that accrues to said workers is $9300. This simple analysis illustrates why normative arguments supporting equity interventions are so difficult to oppose. Positivist arguments against equity interventions are a much harder sell since much more time is needed to demonstrate their consequences. In the left figure above, the minimum wage reduces employment from 3500 (point A) to 2000 (point E) and increases the number of people wanting to work from 3500 (point A) to 5000 (point L). The result is 3000 unemployed workers, which corresponds to a 60% unemployment in Hypothetical City. Meanwhile, in the right figure above, rent control reduces the number of people living in homes to just 2000 (point H) and increases Hypothetical City’s population to 5000 (point N). The 3000 people who are now looking for housing must either room with the 2000 who were lucky enough to keep their apartments or live on the streets. If the apartments are just big enough for one person, rent control would result in a homeless population of 3000, which is 60% of Hypothetical City’s larger population. The consequences of equity interventions are far more reaching than Hypothetical City’s 60% unemployment rate and 60% homeless rate. If job skills are correlated with education and education is correlated with household income, then the workers raised in the wealthiest households would have today’s most valuable job skills and those raised in the poorest households would have today’s least valuable job skills. Since labor demand can be interpreted as a queue that orders workers with the most valuable job skills on the left to those with the least valuable skills on the right, by assumption, it would also order workers from those raised in the wealthiest households on the left to those raised in the poorest households on the right. Before the minimum wage was imposed, all 3500 of Hypothetical City’s original residents worked for $350 per week. Its enactment induced 1500 new residents to move to Hypothetical City. None of them were able to find work because their job skills were less valued than those possessed by the city’s original residents. By assumption, the 2000 workers who kept their jobs were raised in the wealthiest households, the original residents who lost their jobs were raised in middle-class households, and the newest residents who could not find work were raised in the poorest households. With regard to product demand, suppose willingness to pay for products and housing is positively correlated to income. Under this assumption, the blue demand curve in the right figure above represents a queue with the richest resident of Hypothetical City being at the left endpoint and the poorest being at the right endpoint. The richest person would be willing to pay $700 per month for an apartment but would only have to pay $200. If Hypothetical City does not have the resources to police bribery or black market activity, the richest person is willing to pay a bribe as high as $500. Bribes decline along housing demand to $300, the bribe the 2000th richest person is willing to pay. However, since the rent was $350 prior to rent control, bribes would be much lower. If apartments are of unequal quality, the richest resident would get the nicest apartment with biggest bribe and the 2000th richest resident would get the last apartment with 2000th largest bribe. Prior to rent control, all 3500 of Hypothetical City’s original residents had homes. However, rent control displaced the city’s middle class, the 2001st to 3500th richest residents. All ended up living on the street with the 1500 people who were induced to moving to the city with its artificially low rents. Suppose that Hypothetical City also set a maximum price on laptops to make them more affordable to the poor. For simplicity, suppose the demand and supply curves above also model the annual demand and supply of laptops. If the city imposed a price ceiling of $200 on each laptop, the right graph in the figure above implies that only the richest 2000 residents are able to replace their aging laptops. This is so because they are willing to pay higher prices in emerging black markets. If the price ceiling had not been imposed, all of the city’s original residents could continue to replace older laptops every year. The price ceiling means the members of the city’s former middle class are stuck with aging laptops. Thus the policies that are intended to help the poor—rent control, price ceilings and the minimum rate—harms the poor, destroys the middle class, and widen wealth and income gaps. Since these policies had little effect on the residents who were raised in the wealthiest households, equity interventions, at least in Hypothetical City, are grants the their privilege. Tech stocks led the NASDAQ and S&P 500 to new highs. Euphoria has not accompanied these new highs. Global central bank support has resulted in an environment where every market pullback is a buying opportunity. I continue to be skeptical, wary and to this date, wrong. The markets seem to have a continuing ability to shake off and and all bad news. The major concerns are higher inflation and the appointment of a new Fed chief. Either could force central banks and the fed to take a more hawkish stance. The biggest news on the VIX front is the return of Russell Rhoads blogging at http://www.cboe.com/blogs about the VIX and associated volatility issues. The cash VIX was lower for the week, while the November through January monthly futures were higher. The behavior of the monthly futures and the CBOE longer term indexes (VXST, VXV, and VXMT) are showing near support for current volatility levels. The last few days of October and first few days of November include several important economic reports. The Fed will hold a regularly scheduled meeting on Tuesday and announce its policy decisions on Wednesday. It is “Employment Week.” A host of October employment reports will be released at the end of the week. These reports used to move the markets. In addition, we will get reports on the S&P CoreLogic Case-Shiller Home Price Index and U.S. Motor Vehicle sales. Earnings announcements will be coming fast and furious this week. FANG components Facebook and Apple will announce quarterly results on Wednesday and Thursday respectively. Earnings announcements include: Mondelez Int’l, MasterCard, Cummins, ADM, Pfizer, Mosaic, Ecolab, MetLife, Facebook, Estee Lauder, Qualcomm, Prudential, Marathon Oil, Williams, Yum! Brands, CBS, ADP, HCP, Apple, Apache, Starbucks and Duke Energy. Confirm the date and time of any company’s earnings announcement before trading any earnings announcement strategy. The most accurate source of this information is the company’s investor relations website. Economic: Personal Income and Outlays – 8:30, Dallas Fed Manufacturing Survey – 10:30, Farm Prices – 3:00.
International: Germany Retail Sales – 2:00AM, Germany Unemployment – 4:55AM, Eurozone Economic Sentiment – 6:00AM, Japan Industrial Production – 7:50PM. Economic: Employment Cost Index – 8:30, Redbook – 8:55, S&P Corelogic Case-Shiller HPI – 9:00, Chicago PMI – 9:45, Consumer Confidence – 10:00, State Street Investor Confidence – 10:00.
International: Japan PMI Manufacturing Index – 8:30PM, China PMI Manufacturing Index – 9:00PM. Other: FOMC Meeting Announcement – 2:00. Economic: Chain Store Sales, Challenger Job-Cut Report – 7:30, Weekly Jobless Claims – 8:30, Productivity and Costs – 8:30, , Bloomberg Consumer Comfort Index – 9:45, EIA Natural Gas Report – 10:30, Money Supply – 4:30.
International: Germany PMI Manufacturing Index – 455, Eurozone PMI Manufacturing Index – 5:00AM. Other: Minneapolis Federal Reserve Bank President Neel Kashkari to participate in moderated Q&A with Women in Housing and Finance, in Washington, with audience Q&A – 12:30PM. 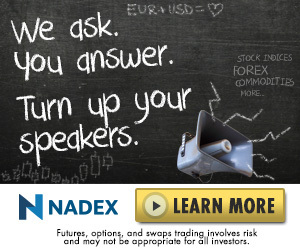 Economic: TD Ameritrade IMX – 12:30.
International: Germany Manufacturers’ Orders – 2:00AM. Other: New York Federal Reserve Bank President William Dudley will speak about Lessons from the Financial Crisis at a luncheon event at the Economic Club of New York, with moderated Q&A, in New York – 12:30PM. I hoped to get to this subject on the air this morning, but we ran out of time. It’s follow-up to Tuesday’s on-air discussion about the choices voters made last November. Joan C. Williams, the Distinguished Professor of Law and Founding Director of the Center of WorkLife Law at the University of California’s Hastings College of the Law, wrote this Harvard Business Review article almost a year ago. Williams’ recently published book, White Working Class: Overcoming Class Cluelessness in America, expands on the topic. Please take a few minutes to read the article before you continue. Williams describes a point of view that is not typically represented on the Stocks and Jocks radio show. Keep in mind that the article was published days after the election, so the passages that describe feelings about Trump probably have changed over time. Nevertheless, I believe the overriding themes still apply. I use the article in a management class. I don’t do political discussion, but I do think it’s important for prospective managers to understand the people who are most likely to be reporting to them in their first supervisor or manager jobs. Because most of the class is product of the working class, the students tend to agree with Williams’ descriptions based on first hand experience. In fact, they tell me that the distinction between white working class and all working class as it pertains to straight talk, political correctness, men’s roles, and resentment of professionals is mostly non-existent. I’m posting the article today hoping to build an understanding about how people react to news whether it be North Korea, hurricane relief, the shooting spree in Las Vegas, or NFL protests. Williams writes near the end of the article, “But to write off WWC anger as nothing more than racism is intellectual comfort food, and it is dangerous.” The point is important, but I think it applies beyond racism. It applied just as easily to claims that the working class is anti-intellectual, sexist, and/or just plain stupid. Races work side by side in the working class world more than they do in most professional settings. Races serve side by side in the military with a disproportionate number of people serving raised in working class homes. The Venn diagrams of what white, black, Asian, and Hispanic working class people believe and treasure overlap significantly. I think that’s really important to recognize as we dig in our ideological heels while discussing politics. It’s also important to recognize that most working class people think those of us who have advanced degrees and professional careers are all generally full of (poop) regardless of our political leanings. The opinions expressed in this article are mine. They are not necessarily shared by other Stocks and Jocks hosts and contributors. One might disagree with his message. One might disagree with his method. However, there was no denying that the man had a purpose; and I believe he honestly believed in both his cause and his method. Fast forward to October, 2017… As more NFL players have made Kaepernick’s protest into a movement that was growing even before President Trump fueled it with his comments at a September 22nd political rally, the purpose of the protest has been lost to a debate over honoring the flag and proper decorum when the anthem is played. Comparatively, discussion of police treatment of minorities is trivial. We know NFL players are protesting, but who or what are they protesting? Is it Trump? Is it an expression of unity with Kaepernick? Is anyone discussing oppression of black people and people of color or bodies in the street, or is the conversation about the method of protest and whether the NFL should allow it? The original purpose of the protests has been lost. The sound of an engine backfiring is distinct, loud explosion. The backfire of NFL protests is equally distinct and loud. Yes, it’s the sound of booing when players take a knee for the anthem; but there is more. It’s also the louder than ever roar of the crowd when the flag is unfurled. It’s the sound of more people singing the anthem than ever before. How can the protesters counter that? They can’t. The subject has been changed. The problem is that the NFL players chose a provocative act for their protest. That those who cherish the country and, therefore, its symbols took offense at the provocation was entirely predictable. It isn’t insensitive. It isn’t racist. It’s taking precisely the offense that the protest was intended to provoke. The majority reaction should not have surprised anyone. The method of protest never was a method that would sway the majority. Many of the people who don’t understand why others are offended have the same reactions when their own favored institutions are attacked. Even when it’s deserved, dare to criticize their families, their alma maters, or their political affiliates. What reaction will you get? Protest without action plan is shallow. Complaining without a solution is an unappealing personal trait. Have many players become involved outside of their anthem protests? Have they given their spare time to the cause? Have they engaged with law enforcement, city officials, civic leaders, and activists? The football players are a bunch of amateurs in the protest biz. They have failed to anything other than create a more intense pregame ritual of patriotism. The NFL hasn’t done better. The league has allowed itself to be neutered by failing to enforce its own policy. Was there a choice? Isn’t this a free speech issue? Writing for the Society for Human Resources Management (SHRM), HR legal expert Shari Lau clarified the First Amendment issue. No federal statute protects private employees who want to express their political opinions at work. The right to free speech under the First Amendment of the U.S. Constitution only guards against government censorship. So while public employers must be aware of their limitations, private companies have no such obligations under the amendment. Therefore, when Joe Employee says he has the right to free speech at work, you can confidently tell him otherwise. Further, the NFL Operations Manual says the following. McCarthy is correct that policies and rules are different, but his reasoning is wrong… as in Management 101 wrong. Policies are high level statements of what an organization requires. Boards of Directors and/or the C-Suite specify policies which are commended to managers who make rules to support them. Policies are not suggestions. Policies guide the rules. Regardless of that important distinction, a policy is worthless if the league can’t or won’t enforce it. A policy that nobody follows is a waste of paper and ink.. The NBA says it will enforce its policy, as it did when it suspended Mahmoud Abdul-Rauf in 1996. Abdul-Rauf said standing for the anthem was against his Islamic beliefs because the flag was a symbol of oppression and that the United States had a long history of tyranny. Eventually the parties reached a compromise. Abdul-Rauf stood during the playing of the national anthem; but he closed his eyes, looked downward, and prayed. The league office will determine how to deal with any possible instance in which a player, coach, or trainer does not stand for the anthem. Individual teams “do not have the discretion to waive” the rule that players, coaches and staff stand for the anthem. The league has the discretion to discipline players who violate the rule. The league does not want teams independently disciplining players. The league suggests that teams address the current political climate by having players and coaches give a joint pregame address at their first home games, a message of unity and how the team is committed to bringing the community together this season. The commissioner’s office sent a separate letter to all teams outlining six ongoing NBA community initiatives. The letter encouraged leaders from each team to provide any further ideas on how the NBA can be a presence in communities and assist with issues in society. I predict that the NBA’s approach will have impact. It will not backfire. Investors were caught of guard last week. September is historically a very poor performing month. There have been litanies of problems: Hurricane Harvey, North Korea, Hurricane Irma and Bitcoin. What happened? The Dow hit record highs four days in a row. The S&P 500 closed the week at another new record high – up 1.58% for the week. The other major indexes turned in equally stellar performances. The small-cap dominated Russell 2000 led the way with gains of 2.31%. The rally left the cognoscenti struggling for explanations. The biggest news on the VIX front is the return of Russell Rhoads blogging at http://www.cboe.com/blogs about the VIX and associated volatility issues. Russell is also a terrific guest on Stocks & Jocks every Thursday morning (listen live)! Of special interest are his series of reports from the CBOE Risk Management Conference. The monthly September VIX Futures contract goes off the board on the open Wednesday. This will be one of the most important weeks of the year when it comes to economic data. We are in the midst of a Central Bank bull market. The Federal Reserve holds its regularly scheduled meeting, and is expected to detail a timetable for reducing its balance sheet. We, also, get data on existing home sales and housing starts. The wild cards remain North Korea and the District of Columbia. The god’s are conspiring against me. I will include my usual scans of earnings announcements next week. There are very few earnings announcements this week. The highlights include: Adobe Systems, Autozone, Fedex, Bed Bath and Beyond, Analogic, General Mills, Herman Miller, and CarMax. Confirm the date and time of any company’s earnings announcement before trading any earnings announcement strategy. The most accurate source of this information is the company’s investor relations website. Economic: Housing Start – 8:30, Current Account – 8:30, Import and Export Prices – 8:30, Redbook – 8:55.
International: Japan Merchandise Trade – 7:50 PM. International Economic: Germany –PPI – 2:00 AM, Great Britain Retail Sales – 4:30 AM. Other: FOMC Forecasts – 2:00 PM, Fed Chair Press Conference – 2:30 PM. September VIX Futures contract (VXU7) goes off the board on the open Wednesday. Economic: Weekly Jobless Claims – 8:30, Philadelphia Fed Business Outlook Survey – 8:30, FHFA House Price Index – 9:00, Bloomberg Consumer Comfort Index – 9:45, Leading Indicators – 10:00, EIA Natural Gas Report – 10:30, Money Supply – 4:30. Economic: Retail Sales – 8:30, Empire State Manufacturing Survey – 8:30, Industrial Production – 9:15, Business Inventories – 10:–, Consumer Sentiment – 10:00, Baker Hughes Rig Count – 1:00.
International: France GDP = 2:45 AM, France PMI Composite Flash – 3:00 AM, Germany PMI Composite Flash – 3:30 AM, Eurozone PMI Composite Flash – 4:00 AM. Other: San Francisco Federal Reserve Bank President John Williams to speak at the Swiss National Bank Research Conference 2017 – Monetary Policy Design, Conduct and Effects in Zurich, Switzerland, with media Q&A – 6:00 AM, Kansas City Federal Reserve Bank President Esther George to deliver the keynote at the “Global Oil Supply & Demand: Prospects for Greater Balance” Conference in Oklahoma City, with audience Q&A – 9:30 AM. Economic: Chicago Fed National Activity Index – 8:30, Dallas Fed Manufacturing Survey – 10:30. Other: New York Federal Reserve Bank President William Dudley will speak about workforce development at Onondaga Community College in Syracuse, New York, with audience Q&A – 8:30 AM, Chicago Federal Reserve Bank President Charles Evans to speak about current economic conditions or monetary policy at the Economic of Grand Rapids Luncheon Meeting, with audience and media Q&A, in Grand Rapids, Michigan – 12:40PM, Minneapolis Federal Reserve Bank President Neel Kashkari to participate in Eye of the Hawk Town Hall Event in Grand Forks, North Dakota, with audience Q&A. – 6:30PM.